The technical language of identifiability is complex. It is important to explain clearly what it means when information is ‘anonymised’ and what the likelihood of re-identification is when using different types of data. We find using pictures is the most helpful way to explain the concepts. ‘Identifiability spectrum’ by Understanding Patient Data can be reused under the CC-BY licence. The current vocabulary for the use of patient data in care, treatment and research is complex and confusing. See a summary of the best words to use and how to use them, as well as our blog, for more information. This data glossary, produced by Connected Health Cities, also clarifies other technical terms around patient data. 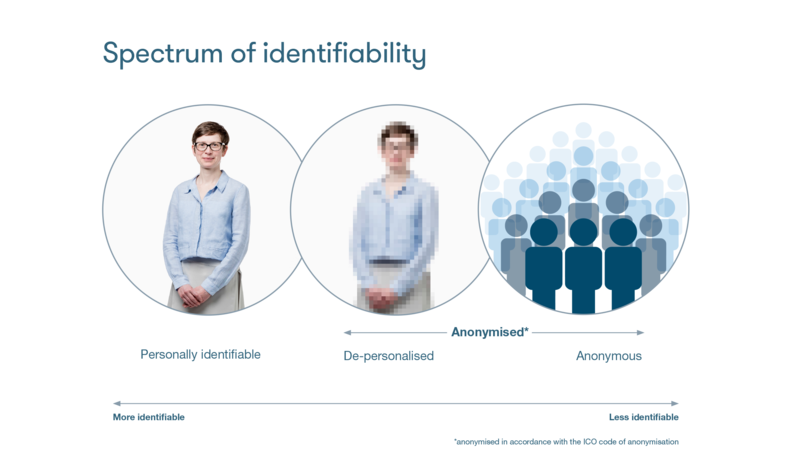 You can find out more about the identifiability spectrum, and the different levels of identifiability in this explainer. We want these words and images to be as widely used as possible to explain these concepts.